It's been a slow season for me so far. Spending my time between hunting, fishing, and traveling. Just haven't had the right timing. Seen some that I haven't had a shot at, missed a couple, and some other missed opportunities. More than anything, it's this friggin humidity keeping me away from the fields, and the mosquitoes are brutal in the evenings. And photobucket just returned to allowing image sharing. They shut that down for a while which left me to post from the phone. I've still managed to put a few on the ground, couple called in and a couple in the wrong place at the wrong time. 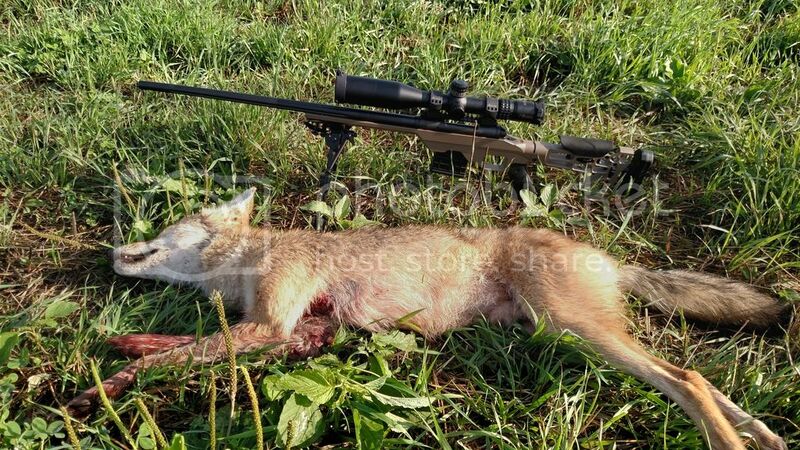 Going all the way back to my last coyote in April...a honey hole kill. The spring haying season was brutal for me. Just wasn't getting any action. I mean...I missed a couple, but I wasn't seeing them like I was used to. 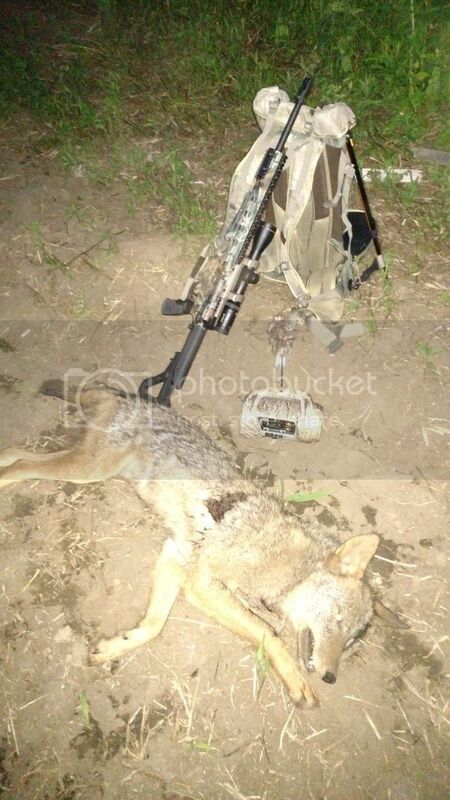 Got this one after reluctantly leaving the house to go hunt a bad wind in early June. This guy came out of the tall grass that I had just walked through...to find himself 37 yards from me. I was obviously facing away and had to pick up and swing the rifle his way. He looked my way twice and I froze until he looked back at the caller. Dropped him right where he popped out of the tall grass. With the low humidity, that same evening, I went to the farm which continued to give me bad winds to hunt. Owner texted me earlier in the afternoon and mentioned seeing one as he bailed hay. Got there in plenty of time to walk across 300-400 yds of open field in the hopes of drawing one out of the large adjacent corn field. This female showed herself before sundown, and ran across 300 yds of open field from the direction I came in from. Check out the coloring on this one. For a moment I thought it was someone's dog as it was running across the field because of that tail. But as soon as she stopped and showed me her profile, I knew she was a coyote. Good sized female too. I'm still after them. Got some more haying coming up, and I think it might be time to fire up the thermacell. I haven't till now, but those mosquitoes!! Thanks for reading!! I stopped in at my uncle's yesterday and asked if you've been around. He said he hasn't seen you...or any coyotes. NO way I'm hunting in this heat...even if I had time. Keep after them. I've missed 5 this season (four different farms), and I think it's operator error more than anything. 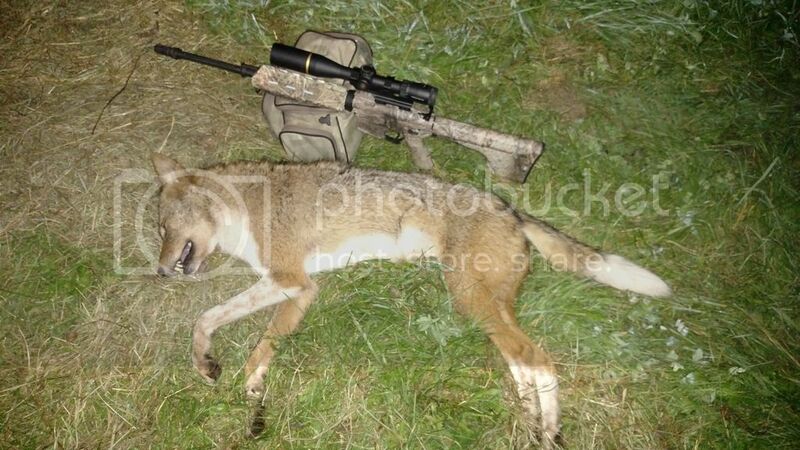 I put a new scope on the 6.8SPC and I've missed twice, but killed one. So I put that rifle away until I can get back to the range. Couple of the other shots were a little longer than normal, so small errors equal big misses. Haven't hunted your uncles yet. 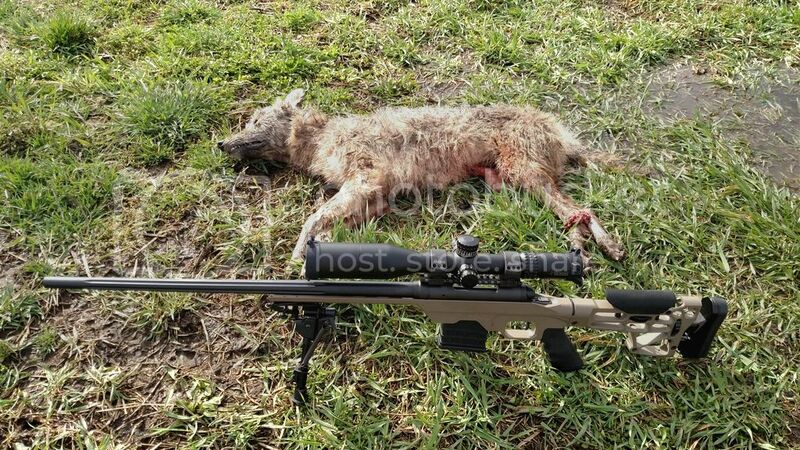 I have yet to kill one there, though I know that the same yotes running through his place are showing up at other places. I have learned some along the way this year...so we'll see how that changes success rates in the future. Now...where the hell's that thermacell? I will give you a A for effort! I can't bring myself to go into the woods in this heat, and am just getting over Lyme arthritis. Keep after them! Very nice. Especially with all of this heat and humidity we have been having. Nice work. Doing it in this heat and humidity must be brutal. The mosquitoes are murder even in the yard. Maybe we'll use up all the heat in summer and have a nice cool fall?